Airedale Springs were awarded runner up in the EEF’s Environmental Efficiency Award category at it’s prestigious awards ceremony earlier in the month. The EEF publicly commended Airedale Springs for designing and building an energy efficient factory, reducing lighting energy costs by 75% and generating over 20% of annual energy usage from solar power. 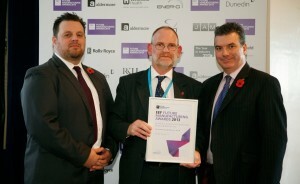 Chairman, Tim Parkinson (Centre) was delighted to receive the award. The judges said, “by taking bold steps and investing in it’s people, resources and technology, Airedale Springs have grown their business despite the challenging economic climate”.